This giveaway is now closed. Congrats to Dawn! As much as I complain about being in the kitchen, I actually only struggle with the “cooking” part of it all. I enjoy baking and absolutely adore kitchen gadgets. Some of the items I’d love to own include an espresso maker, an ice cream maker, and a waffle maker. It’s amazing how you can practically find a gadget for nearly every food. My husband and I primarily drink water, but we do like the occasional sparkling drinks including flavored waters and sodas without high fructose corn syrup. As a mom concerned about the safety of the products we use in our home and their effect on the environment, I was really excited to learn that we can make soda in the comfort of our own home! If you’ve never heard of Sodastream, you must check out the company and the products they offer. I’m highly impressed with the fact that I can turn regular tap water (although I use filtered water) into sparkling water or soda in minutes with little effort. We received the Fountain Jet to review (there are 3 other models available, each one with a different design…same function) along with several Sodamix flavors. There are several starter kits available for purchase, but the basic one includes the machine, the carbonator (CO2), and two reusable, BPA-free bottles. The basic premise of the system is that CO2 carbonates tap water just like a soda fountain. Once you’ve installed the carbonator into the machine, it’s ready to go (you don’t have to plug it in and it doesn’t require batteries). It’s really as easy as filling the reusable bottle with water, pushing the button on the machine to carbonate the water, and adding the flavor you’d like to your “soda.” Choose from over 30 syrups (including regular, diet, and caffeine free). The company also offers energy drinks, sparkling iced teas, and flavor essences. Each bottle of Sodamix (syrup) makes 12 liters (or 33 cans) of soda. The syrups are free from high fructose corn syrup and aspartame. And they taste just. like. soda. My husband and I do our part to recycle as much as we can, but reusable is really the best eco-friendly option. According to the site, “the average American consumes nearly 600 bottles and cans of sparkling water and soda every year.” Much of these end up in our landfills (since we’re not a society that does a lot of recycling). Can you imagine not having any plastic bottles or aluminum cans? And, when you figure out that you could make a liter of sparkling water for 20 cents or a 12 ounce can of soda for 25 cents, it makes eco AND financial sense to use Sodastream. It’s fun (giggle…I sound like a little girl). The only thing I’d love to see are some Sodamix flavors without Splenda. The Sodastream Fountain Jet retails for $89.95 and is available for purchase on the site, and retailers nationwide. Right now, save $10 on any new soda maker with the code “ROCKIN” (valid through December 31, 2009). Be sure to connect with them on Twitter for discounts, promos, and more! Win It! 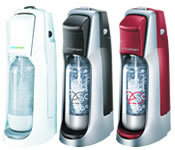 One of you will win a Sodastream Fountain Jet! Simply leave me a comment with something you learned on their site (other than what I mentioned above in my review…the site has a ton of information). Comments will close on December 19, 2009 at 11:59 PM PST. One comment per person, please (unless you do the extra credit). US residents only. Duplicates and comments not including the above information will be disqualified. Comments are moderated. If you don’t see your comment in a reasonable amount of time, send me an email. Bloggers and non-bloggers may enter. If you don’t want to leave your email address, please be sure to check back for my announcement on the winner. Please note that winners must respond within 48 hours of being announced/contacted or another winner will be drawn. Profuse thanks to the Family Review Network for this opportunity! Disclosure: I did not receive compensation for this review. I will be receiving a product, courtesy of the company in order to facilitate my review. I love how drastically lower the calories and sugars are in these. We are big pop drinkers…this would be perfect for our family!! I learned that one of the flavor are orange mango and I would love to try it. you can use there special pressure resistant bottles for up to 3 years. I’d love to have a SodaStream Fountain Jet!! I learned that even the regular flavors have fewer calories than regular sodas (Coke has 100 calories; SodaStream Cola has 34!!) The regular flavors are made with a mixture of Splenda and sugar, while the diet flavors are sugar-free flavored with Splenda alone. I commented on your Calphalon Grill post in the Holiday Gift Guide. I entered the Old Navy giveaway at The Mommy Files. I learned that they have my favorite flavor, root beer! Sodastream started back in 1903! The Little Spirit: Christmas In New York movie sounds cute from your Holiday Gift Guide! I love that not only is there less sugar, there is less calories involved! Haha! And if I have a craving for soda, I don’t have to load 5 kids up to go to the store! You just use plain ole tap water to make your soda. The plastic bottles used in the Soda Stream are BPA free. Each bottle of flavor can make 33 cans of soda. Entered Shannon’s Babalu Felt Tales giveaway. The more the system is used, the smaller our carbon footprint is. Wow, the soda flavors they have are around 1/3 the calories of regular soda! That’s great! I subscribe to your RSS feed via Bloglines. I learned that they have regular flavors, diet flavors and energy drinks! I am a real soda junkie! I love that it averages 25 cents per 12 ounce serving. I also LOVE the idea of a fizz preserving cap! I hope I win!! What a cool gadget! My husband is a soda freak, this would be ideal for him! I found out that SodaStream cola has only 34 calories compared to Pepsi’s 100 calories. I love the Cuisinart Rice Plus Multi-Cooker with Fuzzy Logic Technology from your gift guide…left a comment there too! I like how it costs 25 cents per 12 ounce serving. Please sign me up for the giveaway; I’d love to win one of these! it only takes 30 seconds…wow!!! I went looking for why they opted to use Splenda and didn’t find any information. I did find that the SodaStream is defined as an ActiveGreen product rather than a passive. Each time it is used the carbon footprint is reduced as there was no packaging or bottling involved that would need to be recycled. I learned that it’s not only eco friendly, but wallet friendly as well. This is really cool, I’ve never seen anything like it before. I figured out that if we bought one, it’d take almost the first year for it to pay itself off. After that, it’d be an awesome bargain. I”d seen this in another review before and thought it was just available online/through their shop. I saw on the website that you can also purchase it at Sear’s or William’s Sonoma!! I like the Cuisinart Rice Plus Multi-Cooker with Fuzzy Logic Technology from your gift guide. SodaStream is an “Active Green” product, meaning that consumers are actively reducing their CO2 footprint every time they make soda or sparkling water at home instead of buying it from the store. So not only are we helping keep plastic bottles and aluminum cans out of landfills, by using the SodaStream we actually make a difference in the carbon footprint left from burning gas to go to the store to buy soda. I learned that each flavor has 40 calories or less and has less sodium than regular soda. Thanks for the chance to win this! I learned that they are now offering free shipping! I learned their cola has only 2mg of sodium, compared to 35mg for Coca-Cola. I learned that each flavor has 40 calories, this is just great!!! I entered Shannon’s See’s Candies Giveaway on the Mommy-Files. I left a comment on your Build A Bear Frosty the Snowman review from your Holiday Gift Guide. Thanks for the extra chance to win the SodaStream! There are 31 flavors and when a cylinder is empty, SodaStream takes it back to be cleaned, inspected, refilled and reused. I learned that it would only take 30 seconds to make a bottle of soda! These machines look awesome. I was an infomertial form Sodastream over the weekend. Very cool! I learned that it costs only 25 cents per can of soda, thats some good savings! I learned that it cost just 25 cents per can of soda. Wow! What a neat product!! I would love to be able to put this in my new home!! I really like that I wouldn’t have to mess around with recycling cans anymore! I learned that SodaStream is an “Active Green” product, meaning that consumers are actively reducing their CO2 footprint every time they make soda or sparkling water at home instead of buying it from the store. These Sodastream makers look so great. This is a product that our family could really use. 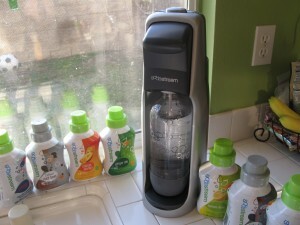 i learned How does SodaStream nutrition stack up against national brands? The diet flavors are sweetened with Splenda. I like the flavors they offer. Would be curious to try out their cream soda and rootbeer. Those are favs in our house. Thanks. I want the Nintendo DSi. I learned that you send your carbonators in to replace them and they are licensed. i learned that there are over 30 flavors! I learned you use tap water to make your soda. I learned that there are 24+ flavors of syrups right now but some have been discontinued and others will be introduced soon. I’d love to win this for my wife, this is the type of this that she’d go bonkers over. The most important thing I learned was the amazingly lower sugar content soda stream flavorings have when compared to other soft drinks. “Many of SodaStream’s consumable packages are completely recyclable, once they’ve outlived their useful lives.” *Thanks* for the giveaway! The calorie count is so drastically reduced! That their sodas have less calories than regular sodas. I learned how often you can reuse the bottles… amazing! I have seen a lot about this and never realized that. Email subscriber… this is a great blog! I learned they have a lovely glass carafe you can buy to make and store your soda in style. I want to try the cola! There is about 1/2 the caffiene in the jetstream than the regular colas. Even a child can make restaurant quality soda easily. Tap water carbonates. They have an energy drink. There are more than 25 flavors available and the refill cartridges for the carbonation are picked up at your door when you order refills. I learned that they have almost any flavor you could want even my favorite diet ginger ale. I left a comment on the Holiday Gift Guide. I am comment #3 on there. I learned that you can turn tap water into sparkling water in under 30 seconds, with no clean-up. Regular syrups don’t contain High Fructose Corn Syrup and Pete’s Choice is equivalent to Dr. Pepper. I learned that it is available in three colors: white, black/silver, and red. I had one of these systems (lost it during a move) and they are fun and easy to use, the only thing I don’t like is that the flavor bottles sometimes drip when you pour. From their site I learned that there are more than 25 flavors available and the refill cartridges for the carbonation are picked up at your door when you order refills. The bottled water industry has created a misconception in the United States that bottled water is cleaner, safer, and healthier than tap water. In fact, both regulation and enforcement of bottled water safety is weaker than of tap water safety. Federal, state, and local environmental agencies require rigorous testing of tap water safety. I learned that the cost is just 25 cents per can of soda or 25 cents per liter of sparkling water…Wow! They were founded overseas in 1991 and started operations in the United States in 2003. I wonder where they started? More importantly, their plastic elements are PBA- and phthalate-free. I like the Cuisinart Rice Cooker with Fuzzy Logic and left a comment there. I entered Shannon’s Subway giveaway. I Stumbled your post (lintpicker). Each bottle of flavor can make 33 cans of soda. Didn’t know this machine existed. The website showed several color choices which is nice! I drink lots of water and tea and this looks like a healthy way to drink liquids without all the bad ingredients in pop – like fructose corn syrup. Great to have choices like diet and regular pop flavored. Looks like kids would enjoy it too! Healthier living for the whole family! Globally, 206 billion liters of bottled water were consumed in 2008. Crazy huh? Globally, 206 billion liters of bottled water were consumed in 2008. Has lower calories! And after this holiday season, that is going to be important! Regular flavors contain no high-fructose corn syrup, and diet flavors are sweetened with Splenda® brand sweetener. I learned that SodaStream manufactures their own home soda makers to exacting specifications and therefore are able to offer a two-year warranty! I commented on your Holiday Gift Guide @ “Nintendo DSi”! I learned that one SodaStream carbonator makes 60 or 110 liters, equivalent to 170 or 310 aluminum cans! 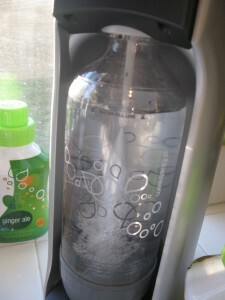 With SodaStream, you can adjust the level of carbonation from mildly fizzy to super bubbly just by pressing a button. I learned when a cylinder is empty, SodaStream takes it back to be cleaned, inspected, refilled and reused. I’m loving the fact that is only cost 25 cents per 12 ounce serving! It’s an “As Seen On” item. WOW!!! A 1/3 the calories of regular soda! I LOVE THAT!!! The United States is the world’s largest consumer of bottled water. Who knew. I learned According to the US Recycling Institute, more than 80% of bottles in the US do not get recycled and end up in landfills. Also, an estimated 4.7 million tons of greenhouse gas emissions were produced in the process of replacing the 134 billion bottles and cans not recycled in 2005. WOW! I learned that they have less calories than other sodas. How much the difference in sugar was between this and store bought soda! thanks for the contest! I’d love to see them make products with pure cane sugar! I learned the energy required to make water bottles in the US only, is equivalent to 17 million barrels of oil. I learned that one of the flavor are orange mango and How much the difference in sugar was between this and store bought soda. One bottle of concentrated Energy Drink sodamix makes 50 8-oz.servings. The very best homemade soda I have ever tasted…. 5 stars quality.